If you’re dreaming of long luscious locks on your wedding day and your hair is more ‘blah’ than a wet Sunday then it’s time to consider hair extensions. They are a fabulous option for adding volume and length. It makes sense to show off your veil or crown. —but is it the right move for you on such an important day? You always want to make sure, that you still look like yourself on your wedding day and that you are comfortable. BarcelonaBrides will help you with a little insider knowledge how you can get your dream bridal hair style for your wedding day. When making the decision of whether to wear extensions or not, first decide what you will be wearing and how you will want to style your hair. “A good way to figure that out, is first to determine whether you want to wear it up or down,” says Martina Harrer, Owner of Hairoverheel Hairextensions. Extensions give you longer, thicker, fuller hair, that looks completely natural. They open so many more options and choices for your wedding-day hair-style and they do work for all face shapes and all ages. Hair extensions can be a bride’s best friend. Clip-in extensions are the most popular, for both, brides and the bridal party and they are a simple and effective way to get that perfect wedding-day hairstyle. It is an more affordable way to add length and volume as well they are also a terrific way to add body to fine and thinning hair. 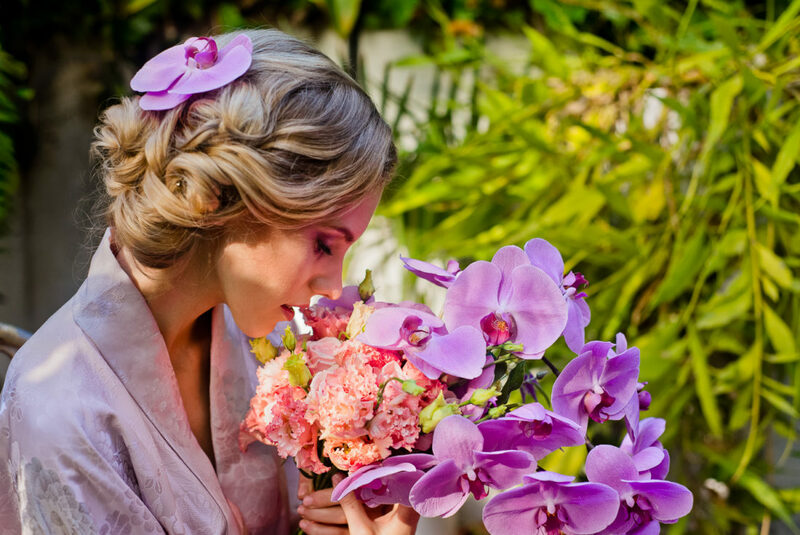 We always recommend having a trial before your wedding, to review different wedding hairstyles. Ask us about Clipin-hair-extension and Clipins 4Rent option, Everything you always wanted to know before getting hair-extensions for your dream bridal hairstyle on your wedding-day. How can hair extensions help me to create my desired wedding hair style? Hair-extensions can help you create your dream hair on your big day with fuller, thicker and longer locks that feel and look completely natural. Make sure you opt for the best quality hair extensions brand. Barcelona Brides recommends Hairoverheel.Whether you need that extra length, volume, fade-free highlights or texture, hair extensions give you healthy, lustrous locks to help create the perfect hair on your special day. 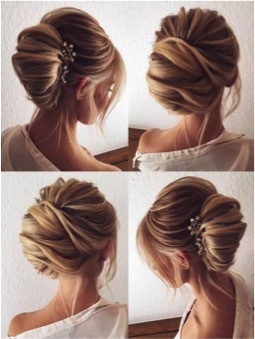 I want to have my hair up for my wedding-day hair. Will the extensions show through? The extensions should be 100% natural human hair and applied in small sections. The tapes or clip-ins allow you the freedom to style the hair as if it were your own – giving you endless styling options: casual, modern or traditional. Will I be able to wear my hair on my honeymoon? Depending on the type of extensions you choose , following just a few simple guidelines and a little extra care in your haircare regime will keep your wedding hair extensions looking fabulous throughout their lifespan. If you are going to a hot climate country for your honeymoon, you can wear you hair up, down, style and even swim with them. Make sure you use quality aftercare products for longer lasting results. All aftercare information and products should be discussed with you by your extensions specialist, at the initial consultation and after the application of your hair extensions. By choosing the right hair extension system, clip-ins or tape-ins, the wedding hair extensions will not damage your hair if applied by a professionally trained and certified specialist. Unlike other extensions which are attached with synthetic glues, waxes and clamps, semipermanent hair extensions, like tape-ins are easily removed with a special removal gel from a trained professional at the salon, causing no damage to your own natural hair. You will receive an exact quote on consultation, as the cost depends on the quantity and length of hair extensions which are required to achieve the desired look. Are you getting some wedding hair extensions for your own big day? Do you think it’s worth the money? Let us know on social media or in the comments. Temporary hair extensions or natural Clip-in Hair? Clip in extensions are temporary and just as the name suggests they can be clipped into your own hair whenever you like. They are ideal for your wedding day if you don’t want the commitment of longer-wear fitted extensions. It’s important to choose the right bridal hair stylist who’s experienced with fitting extensions to avoid the tell-tale bumps in the hair that can be caused by the extension clips. 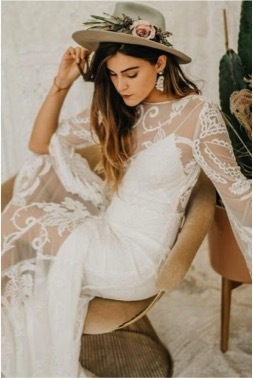 We have bridal stylist that can place your clip-in extensions strategically, just where you need them for your individual bridal style, to create length and thickness that looks natural. We match your clip in hair extensions to your own natural hair shade. If you are looking to change colour, then do so before you purchase your clip in extensions in order to get a true match. Curled and waved styles are perfect for blending your clip in extensions with your natural hair and look beautiful on your wedding day. Hairoverheel.com offers you a bespoke and couture range of clip in extensions that are individually tailored to your natural hair. Semipermanent hair-extensions like tape-ins are more discreet and virtually undetectable and are applied to your own hair ‘strand by strand’ and last for many weeks to months with the right aftercare. They give you endless choice when choosing your perfect bridal style for your wedding day. Ideally a couple of days prior to the wedding day. This will also give you time to get used to wearing them and caring for them. If you are planning to have colour make sure you have that done first so that your hair extension specialist can do a perfect colour match for you. 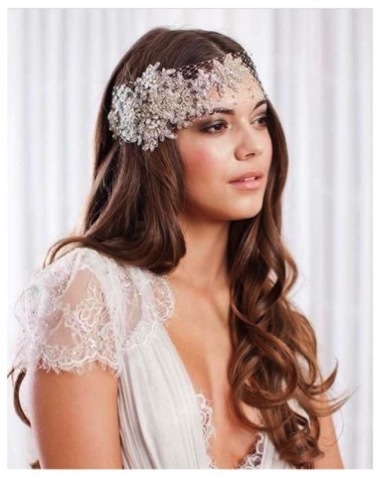 Are you getting some wedding hair extensions for your own big day? Get in touch with us info@hairoverheel.com.